The new American Honey Queen and Princess were selected at the American Beekeeping Federation convention in Hershey, Pennsylvania. They will be posting about their travels on behalf of the beekeeping industry. Keep an eye out for new facts, beekeeping topics and videos throughout the year. In the United States there are around 200,000 beekeepers! Most of these beekeepers are hobbyists, or small-scale beekeepers, with less than 25 hives. Other beekeepers are commercial, and they might have hundreds or even thousands of hives of bees. All of these beekeepers had to start somewhere; some of them grew up in a beekeeping family, while others may have heard about beekeeping through a friend, a club like 4-H, or even by reading about it. If you want to learn about beekeeping, here are some ways to find out more. Beekeepers in a meeting learning about the industry! 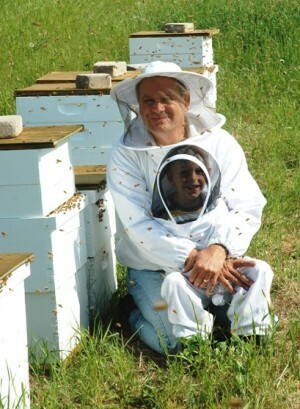 The first step you can take to become a beekeeper is to join a local beekeeping organization. Beekeeping clubs usually involve a group of beekeepers coming together to share with each other the knowledge they have about keeping bees. Often these clubs meet every month, and even have speakers that present to the group, so everyone can learn more. There are even big conventions held in different places throughout the year. These conventions may be one day to a week long, and are great ways to learn more about keeping bees and meet other beekeepers. To find a club in your area, you may have to do a little research. Ask an adult to help you look online, in newspapers, or another source for information on clubs in your area. If you know a beekeeper, you can try asking him or her for information on local or state organizations. This is a beekeeping supply store in Kentucky! Many beekeeping clubs have ways of helping youth get involved with beekeeping through scholarships, or providing you with a mentor that will help you along. Some clubs may even give you your first package of bees and the equipment you need to get started. The club might also offer a class you can take that teaches you everything you need to know to start beekeeping. Once you have learned a lot about honeybees and beekeeping you can get started! The equipment you will need depends on how many colonies of bees you start with. I recommend starting with two hives, which gives you the chance to compare one hive to another. You can buy equipment from a beekeeping supplier, which is a store that sells almost everything you need to start keeping honeybees! Queen Alyssa and Princess Danielle are getting ready to head to a convention this month in Hershey, Pennsylvania, so even they can learn more about keeping bees!